I bet you've never heard of Wolf-Rayet stars. I certainly hadn't until I started researching the different types of stellar objects in the Universe. It was back in 1867 that two astronomers, Charles Wolf and Georges Rayet, at the Paris Observatory, noticed three stellar objects in the constellation Cygnus that displayed rather unusual properties. Where most stars feature absorption bands amongst their spectrum, these newly-discovered objects appeared to have extremely broad emission bands. The nature of these bands were initially hard to explain. It wasn't until 1929 that the idea surfaced that they were manifestations of huge amounts of matter being continuously ejected from the objects. This led astronomers to conclude that these stars were extremely massive objects equivalent to at least 20 solar masses and were also very hot, from 25,000 to as high as 200,000 degrees Kelvin. The high rate of matter loss is in the region of a billion times more than our Sun. As you will find explained further down the page, these stars have been nicknamed, by some astronomers, "ticking time bombs". 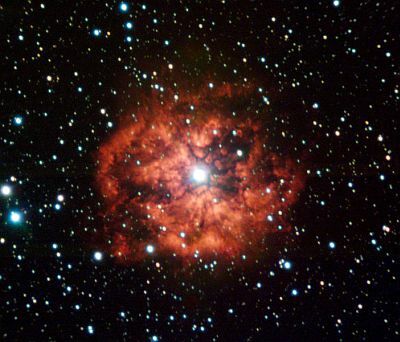 Here we have an image of the Wolf-Rayet star WR124, in the constellation Sagitta. As you can see, it is surrounded by a prominent nebula, the result of the expulsion of matter. In fact, most of these objects are found at the centre of nebulae. These stars have been divided into different classes, according to what element their emission lines represent. Broadly, these elements are either nitrogen or carbon. From this, their spectral type is designated WN or WC. This Wolf-Rayet star is worth a mention here, because it is the most massive star ever discovered. It is currently the equivalent of 265 solar masses. As it has been shedding material for millions of years, it is estimated that it started out with around 320 solar masses. As current theories preclude the formation of stars above 150 solar masses, it is thought that this one is the result of several stellar bodies colliding and merging. It is likely that it will end its life as a hypernova, an explosion some 100 times more powerful than a supernova. Because the Wolf-Rayet stage in star evolution is the last before they go supernova, the "ticking time bomb" label has been applied to them because of the resultant strong emission of lethal gamma rays. If any of these stars are orientated in just the right way, the gamma ray burst could hit Earth, resulting in a serious threat to life on our planet. It was thought, for some years, that a binary star system in the constellation Sagitarrius, consisting of a Wolf-Rayet star, WR104, and an OB star, were in such a position that we on Earth were looking directly along the axis of its revolution. When these stars go supernova, there would be a strong chance that the resulting gamma ray burst could hit us, with lethal results, even from 8,000 light years away. Fortunately, more recent observations have indicated that the axis of the system's revolution is not as directly pointed at Earth as previously thought.